An arrhythmia (heart rhythm problem) can make your heart beat too fast. The problem is often caused by cells in your heart that aren’t working as they should. It may cause bothersome symptoms, such as an irregular heartbeat, dizziness, and shortness of breath. Your doctor has recommended catheter ablation to treat your arrhythmia. This procedure destroys the cells that are causing the problem. Tell the doctor about all prescription and over-the-counter medications you take. This includes herbs, supplements, and vitamins. It also includes daily medications such as insulin or blood thinners. If you are allergic to any medications, tell the doctor. Have any routine tests, such as blood tests, as recommended. Don’t eat or drink anything 12 hours before the procedure. The heart’s signals are mapped. To find the problem, an electrophysiology study (EPS) is done. During this study, the doctor tries to induce (start) your arrhythmia. An electrical map of the heart is then created. This shows the type of arrhythmia you have and where the problem is. Using the map as a guide, the doctor knows where to ablate. Problem areas are destroyed. Once the EPS shows where the problem is, an electrode catheter is moved to that area. Energy is sent through the catheter to destroy the problem cells. The heart’s rhythm is tested again. After ablating the problem cells, the doctor tries to reinduce (restart) your arrhythmia. If a fast rhythm can’t be induced, the ablation is a success. But if a fast rhythm does start again, further ablation may be needed. 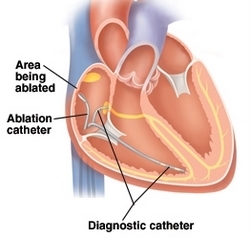 In most cases, catheter ablation is done in an electrophysiology (EP) lab. It often takes 2-4 hours, and sometimes longer. You’ll receive medication to prevent pain. Medication will also help you relax or sleep during the procedure. If you feel uncomfortable during the procedure, tell the doctor or nurse. Getting started: First, skin on your groin or neck is washed. Any hair in that area may be shaved. This is where the catheters will be inserted. An IV (intravenous) line is started in your arm. Medications and fluids are provided through this IV. To help keep the insertion site sterile (germ-free), your body is draped with sheets. Only the area where the catheters will be inserted is exposed. Inserting the catheters: The skin where the catheters will be inserted is numbed with a local anesthetic. This is so you won’t feel pain. Then a small needle is used to make punctures in your vein or artery. Catheters are inserted through these punctures and guided to the heart with the help of x-ray monitors. Finishing up: When the procedure is finished, the catheters are taken out of your body. Pressure is applied to the puncture sites to help them close. No stitches are needed. You’re then taken to a recovery room to rest.